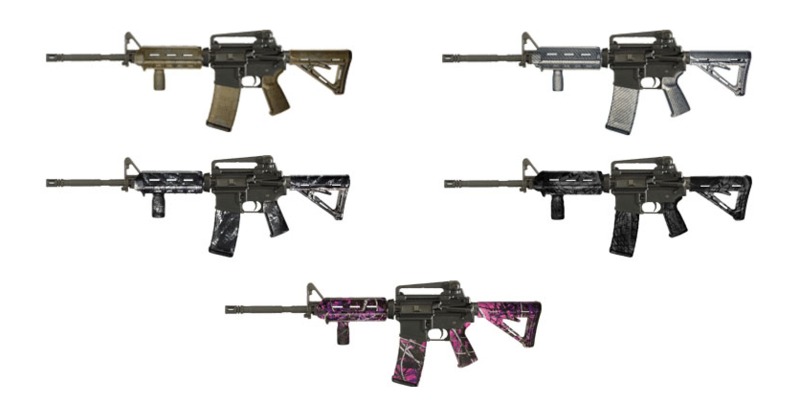 PRINCETON, FL – January 11, 2013 – TWN Industries Inc., the leading Water Transfer Printing material supplier, has partnered with Matrix Diversified Industry (MDI) to offer a vast array of camouflage and decorative patterns on Magpul furniture kits. These kits designed by MDI will be exclusively distributed by Sports South, LLC and the extensive network of retail dealers that they support. Look for these kits to arrive on dealer shelves starting January 2013. Ronnie Whitten, Director of Sales of Sports South, stated “MDI, working with Sports South, will prove to be a huge asset to firearms dealers by combining great products with great distribution for satisfied customers and giving the consumer many different options to dress up their existing AR 15 Platform firearm and give it a new look at an affordable cost.” The initial pattern launch will include Carbon Fiber, A-TACS AU, Muddy Girl, Bounty Hunter, and Kryptek Typhon. “This program will bring together the quality and precision of Magpul and the superior imagery of TWN’s Water Transfer Printing patterns,” says Jeff Graham, National Accounts Sales Specialist for TWN Industries.